here in the u.s. it is presidents day. since it's an election year, I've been thinking about past, present and possible future presidents a good bit. I expect I am not alone. there's always a good deal of discussion during the presidents day holiday about who were the 'best presidents' in the history of the united states and who were the 'worst presidents.' lincoln routinely is regarded as one of the best presidents if not the best president, the other presidents who often occupy the top five slots include: franklin d. roosevelt, george washington, thomas jefferson, and theodore roosevelt. forty-two individuals have held the office of president of the united states; up until now all of these individuals have all white males. this coming election year many people are working to change this dominant demographic - not surprisingly I am among those who believe that we need a change, but not just for demographic reasons. borrowing from greg over at junk thief, I'm going to borrow one of his regular features 'interactive monday' and conduct a completely unscientific and informal survey. in the comment section list who you feel are the two or three best presidents during the last 100 years and who are the two or three worst presidents in the last 100 years. for a list of presidents click here. I thought I'd modify the typical best/worst survey and focus on the 'modern era.' don't feel as if you have to be a citizen of the united states to answer - in fact, responses from readers throughout the world will be most welcomed! 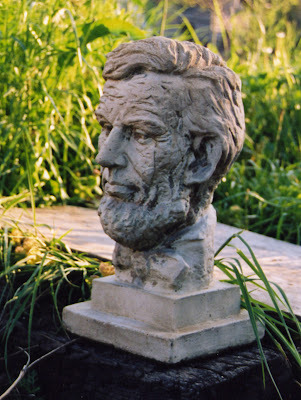 photo: abe lincoln bust in a garden somewhere in southern illinois ~ 2004. President's Day--does this mean I can't go to the Post office today? They both worked hard to implement programs that were very worthwhile. They both thought about the invisible americans --the poor, the children, the overlooked. President Carter, JFK, FDR, and Clinton. Coolidge could have easily been great, but he chose to just take it easy and bury his head in the sand instead. worst list== Wilson, Hoover, the two george bushes, Reagan, Nixon. All of whom will be seen as heroes in some way, (ugh) why can't we be honest about a bad president??? Personally, I think that FDR was our only great President in the last 100 years. There might be an argument to be made for Taft, whose administration busted more trusts than TR's did and who is the only President of the United States to later become Chief Justice of the Supreme Court. The three worst presents us with an embarrassment of riches, although the current occupant would rate low on my list. Also Wilson, who was a warmongering bigot. I guess Nixon might deserve a mention here just because of his contempt for the Constitution, a document he was sworn to uphold and defend. Most Presidents are mediocrities, and I would put all the Presidents of my lifetime in that category except one. Johnson verged on greatness and might have been great had he not had such a sweet tooth for Vietnam. Worst: Bush 2, Nixon, Harding. I must agree with Len. When I thought of the presidents over the past 100 years, only FDR stood out. The others I would put into one of three categories: "did some good", "did no harm," and "did harm." I also think it would depend on the lens that you would use to judge them...as Clinton falls in the third category for me on some issues.